Every Pinoy child from the late 70s to the 80s or older has a rite of passage where they encountered the hobby of collecting a pet spider for fighting against other spiders. I remember the manongs who would visit our school in Q.C. coming from as far as Bulacan to sell us their latest prized fighters for up to P20 for the most expensive spiders (kid baon was around P4 a day at that time) and we'd lose our heads setting up an immediate spider derby near the school church. The manongs would carry their wares in a wooden box, "spider apartment" with a sliding glass cover revealing the small compartments were each small to mid sized spider was sleeping, waiting for the owner to scoop it up with a wooden scooper into a ready matchbox for the lucky ( or gullible ) kid who buys it. In the rural provinces, spider fights are still a prized pasttime for adult males and kids who scrounge around the fields and trees of their community to gather spiders in the wee hours of the morning. The best spiders have thick, long arms and a not too bulbuous abdomen. Spiders are usually caught in the underside of tree leaves or have a web spun among the branches or are on talahib clumps and enterprising spider fighters of the neighborhood, make their hunts in the early morning or during dusk when most spiders come out to weave their webs. Spider fighting is done on a barbecue stick where one bettor's spider is placed on one end of the stick while his opponent's spider is placed at the other end and the gathered crowd of juvenile minded menfolk cheer and jeer for their preferred eight-legged mini-monster to win. 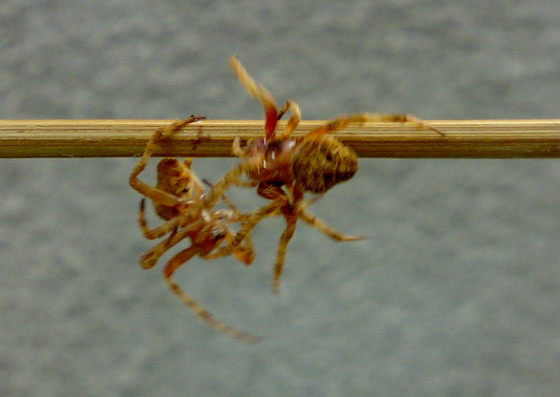 Once the spiders cross each other's path, they either drop off the stick with a line of web from their abdomen like a bungee cord or they smell blood and grapple onto the other spider's body and bite--if a bite and grapple is successful, the spider that is advantageous proceeds to wrap it's prey with spidersilk. Then the bettors exchange small-change money bets. Although some local governments in the rural areas and in Metro Manila have issued ordinances against any form of betting or gambling being banned near schools or involving kids as participant, spider derbies still remain popular as ever but kids and the manongs who collect spiders for a living have gone as inconspicuous as they can manage to keep the favorite insect fighting hobby of all Pinoy kids alive and well. Spiders that are used in these matches are often kept in a wooden long box similar to what cigarette vendors use but with a sliding glass cover and partitioned compartments that are called "apartments" by the old, veteran spider collector and seller. For kids, a matchbox with a thick coconut leaf blade separating the spiders stored are the preferred compact and portable spider housing. Other Asian countries with a tradition of spider fighting include Japan--which uses the same spider types popular among Pinoy spider derby aficionados and Singapore too.